The clade Anapsida includes turtles and all their extinct relatives, which include millerettids, procolophonoids, pareiasaurs, as well as more poorly known taxa such as Acleistorhinus, lanthanosuchids, and nyctiphruretians. As you'll notice while you tour this section of the University of California Museum of Paleontology, the anapsids once consisted of many groups, many of which could be considered to have been quite successful until their extinction. Today, only one group of anapsids remains ( Chelonia -- the turtles), which truly could be called an evolutionary success story. 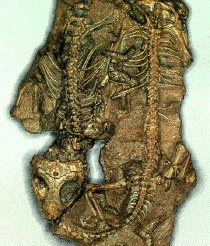 To the right: Two articulated skeletons of the Lower Triassic procolophonoid Owenetta from South Africa. The small, millipede-like arthropods that are also visible probably fed on the carcasses before they were buried (and fossilized). Click on the image to view a larger version. Extant (living) anapsids have a nearly worldwide distribution; they inhabit all the continents except Antarctica. The geographic origin of Anapsida has not yet been determined because the fossil record of Paleozoic tetrapods is too poor and localized, but the oldest known anapsid comes from the Lower Permian of North America. By the Upper Permian, anapsids are also known from Europe, Asia, and Africa. Click on the buttons below to continue learning about the Anapsida. Visit the page on Phylogeny and classification of amniotes in the Tree of Life for more information on anapsid phylogeny and the origin of turtles.